On Monday, we completed the installation of the 3rd green roof on the Swarthmore College campus by planting 15 different types of sedums and 7 other types of plants on the roof of the new dorm, Kemp Hall. Two different techniques were used to plant the five levels of this roof. Four of the five levels were gently scattered with 100 lbs of 6 different types of sedum cuttings. These varieties were mixed by hand as seen in the image above. 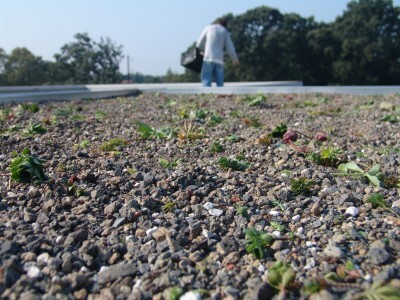 Sedum is the most common plant chosen for extensive green roofs because it can tolerate and thrive in all of the unique conditions of growing on a roof. These include drought in a thin, free-draining growing media and periods of saturation of the substrate layer. High temperatures are found on roofs where there is no shelter from trees or shrubs and the surrounding concrete and stone absorbs and radiates heat. 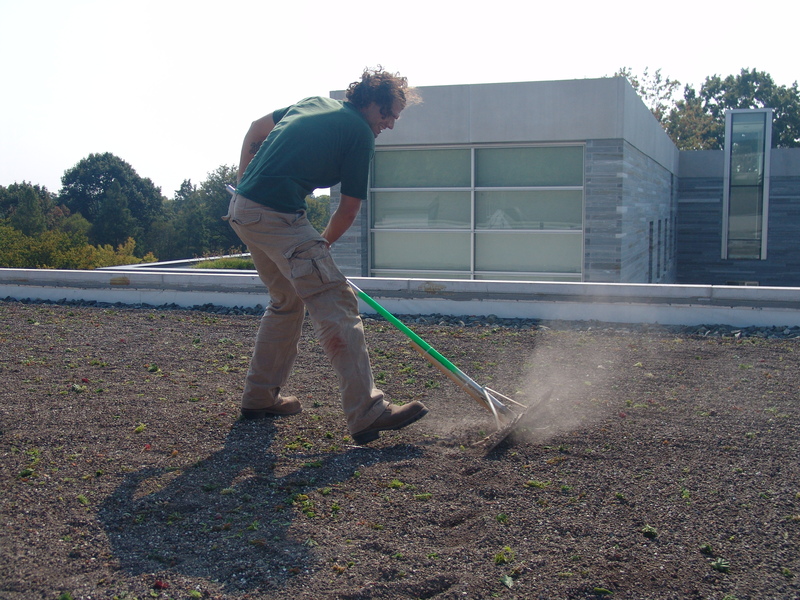 These roofs are also exposed to high winds which may cause physical damage to the plants and desiccate vegetation. There are nearly 600 species of sedums with a wide variety of leaf colors and textures to choose from. Depending on your location in North America, sedum can produce a floral display from March to November. Hardy from zone 3a to 9, sedums are commonly known as stonecrop or orpine. This low-growing genus can have a flower color of pink, white, or yellow and some produce a red to evergreen rosette that changes color with the seasons. 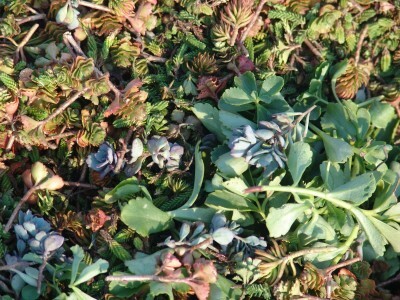 A mixture of the following sedums was chosen for the 4 of the 5 levels of Kemp Hall roof. 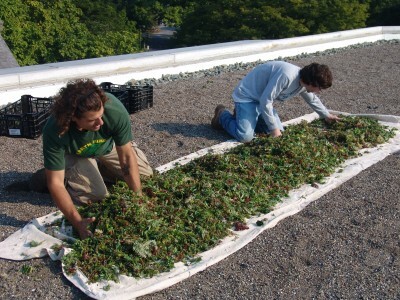 After the cuttings were evenly distributed on top of the roof, they were raked into the growing media and watered. These cuttings will root and grow into an attractive green roof. 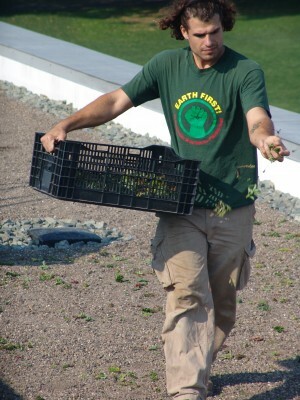 This is the technique also used to plant the majority of the Alice Paul green roof. Visit our blog tomorrow to learn about the other techniques used to plant the remaining level of Kemp Hall and the unique plants used. Click here to read past posts about the installation and design of the Kemp Hall green roof. That’s a whole LOT of sedum! I can’t even imagine how beautiful that will be. Hello 🙂 I have bought some sedum to plant in a mountain garden. Lots of rocks in the ground. I was thinking of spreading the cuttings over the ground and maybe putting a thin layer of soil on top. Would this be successful?